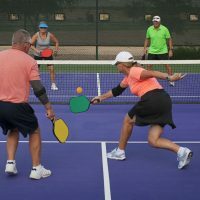 The Rally Tyro Composite Pickleball Paddle Bundle was created by a team of world class top-rated pickleball players and coaches who wanted to introduce an easy to play, high-performance paddle that can quickly improve your game. Driven by years of research and development, the Rally Tyro is the first paddle with this aerospace composite honeycomb material technology at this price point. 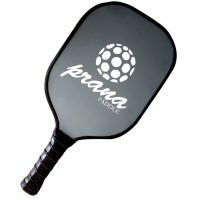 The paddle includes a large number of technical innovations to make it very player friendly for players of all types – from rookies on up. Not only does it out-perform the competition it was designed to withstand the rigors of intense daily use. 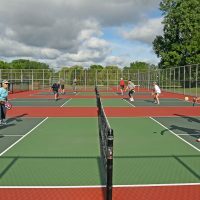 High quality set with USA built paddles from PickleballCentral – the pickleball superstore. 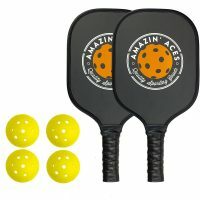 2 composite paddles and 4 indoor Jugs pickleballs (also good for outdoor use in less windy conditions), great for new players! Durable construction and excellent performance for both power and control game. 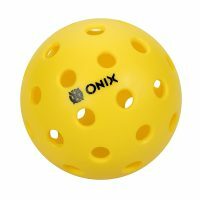 Lightweight paddle 6.5-6.9 ounces – Great for players who want extra ball control and quick reaction times, children and those who have elbow, wrist or shoulder injuries. 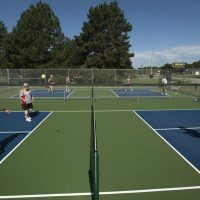 Guaranteed against manufacturing and material defects from PickleballCentral for 1 year from the date of purchase. 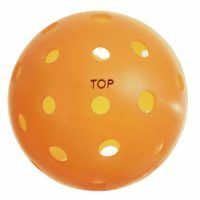 Full sized face provides large sweet spot, super ball control, and long term durability. High quality perforated cushioned grip with medium tack for comfortable play all day. 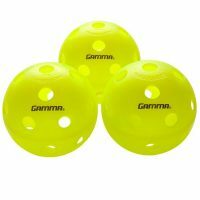 Softer ball with enhanced bounce is more forgiving for indoor play and a great option for new and intermediate players. 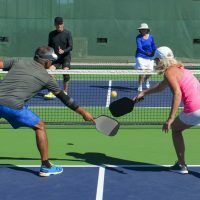 As new pickleball players, we played one time with a wooden set of paddles that came with a ball. That ball cracked, and the wooden paddles felt weird. We played with a couple that had this Tyro set, and we bought the same set to use the next time we played. These paddles feel more comfortable, and the balls survived. The sound of the balls hitting is quieter, too. This set is definitely worth buying if you’re a beginner, and we’ll probably use them a long time. This is a great paddle if you are just learning the game OR need something that doesn’t tire your arm out easily. 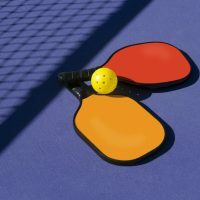 I used this paddle for the first few months of pickleball play and found that my arm did not get too tired after 3 hours of play. Now that I’m a little more experienced I’ve moved up to an 8 oz. paddle which I bought through Pickleball Central and I love that one, too. The one I bought after building up my muscles and skill level is the Paddletek Bantam EX-L, which I love. So if you’re looking for a lightweight paddle to begin learning (6.7 oz, I believe), or to not tire your arm, I recommend this PTK-TYRO paddle. 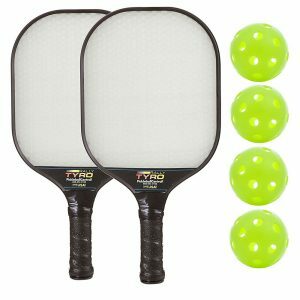 The Rally Tyro Composite Pickleball Paddle Bundle are awesome! The only downside that we didn’t realize until we had them in our hands is that the black rim around the edge is raised, so if you hit a ball off of the edge of your paddle, it sometimes sends the ball in a crazy direction. But apparently the ones that don’t have a lip fall apart more easily, so it’s really a matter of how often your willing to replace your paddles, I guess. Also, I would have preferred if this set came with two inside and two outside balls rather than 4 inside balls.